Why do the images look the way they do? As you may know by now, the In Situ Ichthyoplankton Imaging system (ISIIS) is the instrument we used to obtain the images of plankton for Plankton Portal. It captures images as it travels through the water column. The idea behind this imaging system was to film a large volume of water in order to detect and image relatively rare zooplankton, like larval fish and small jellies. So why are the images are black and white, very contrasted and almost like a line drawing? Our challenge in designing this instrument was to be able to employ macro-photography at a fast speed, obtain a large depth of field (large volume sampled), while minimizing motion blur. After researching for a few months we settled on an imaging technique that could answer our demands: Shadow imaging or focus shadowgraphy! 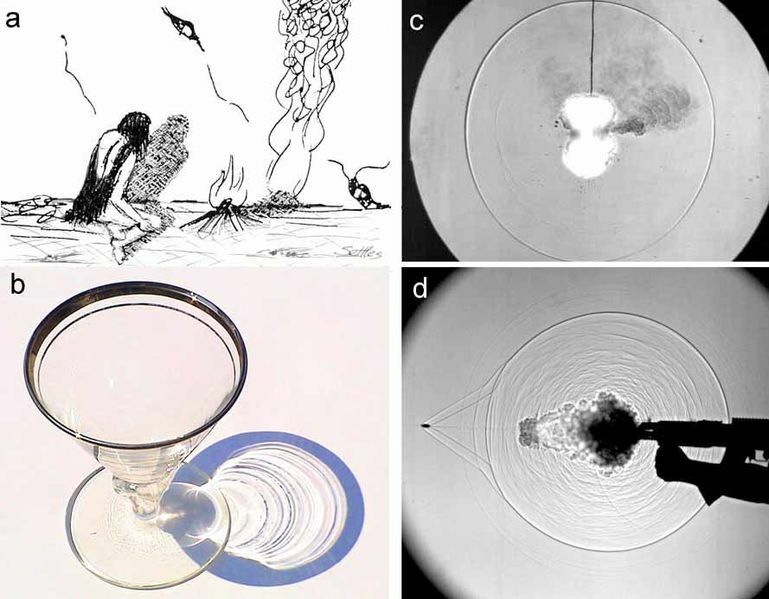 This technique is actually not new and was used extensively for the study of shockwaves as well as ballistic. The idea is to cast a shadow onto a sensor or film instead of trying to directly record the imaged object. Let me explain: since most plankton are small and quite transparent, imaging using a traditional camera must rely on ambient sunlight. In this scenario, you won’t see much because the organisms blend into the surrounding water. Imaging a shadow cast by ISIIS reveals their distinct shape and location. It’s like looking at the shadows at the bottom of a swimming pool created by the sun going through the water! In this case, we do not use the ambient sunlight, but create our own light beam using a blue LED light and a set of mirror and lenses. The light is collimated, meaning that the light beam travels in a tight, parallel direction like that of a laser thus ensuring that even over long distances, we can create a very good shadow. We then use a specific set of lenses aligned with the camera to capture this shadowgraph image. 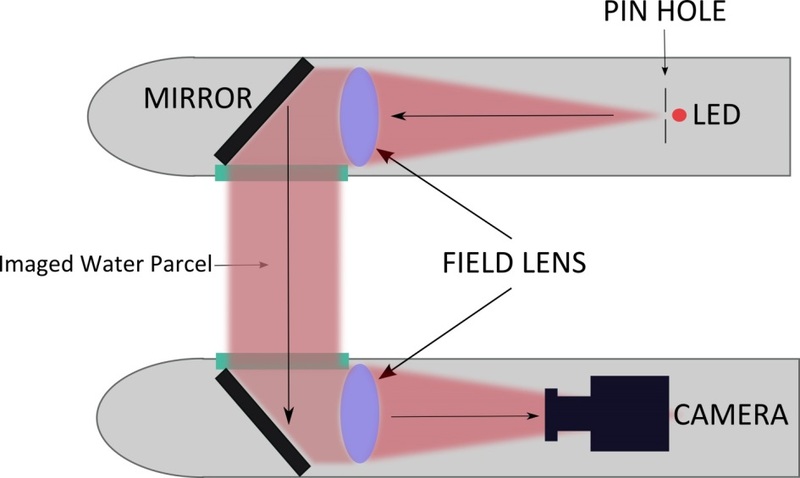 Since the light beam is directed toward the camera sensor, it allows for very high speed imaging and avoids motion blur when moving through the water. Lastly, we invert the images for aesthetic purposes on the site, and voila! Now you have a beautiful set of black and white images of plankton for the world to see! So for all the people who asked about why some of the ctenophores (like lobates, beroids, and cydippids) were so ‘overexposed,’ now you know. These animals are dense and not very transparent, thus casting a hard shadow onto the lens. Instead of appearing black as a typical shadow, we have inverted the image and now they appear white. How do we get the images? Since the 1800’s, plankton has been studied and collected using simple nets with very fine mesh. The process of analysis of these plankton ‘samples’ is tedious, labor intensive, confined to laboratory, and can only be done on relatively small areas of the ocean. By sampling in this manner, it is difficult to get a good understanding of how planktonic organisms are distributed and how they interact with each other. Yet plankton represents a very important part of a global system feeding larger animals like fish, whales and many others. The In Situ Ichthyoplankton Imaging System (ISIIS) is one of a few systems in the world capable of improving the way we study plankton to better understand their life and function in the marine environment. Instead of using an actual net to capture plankton, ISIIS captures the images of the organisms and information about their immediate surroundings. 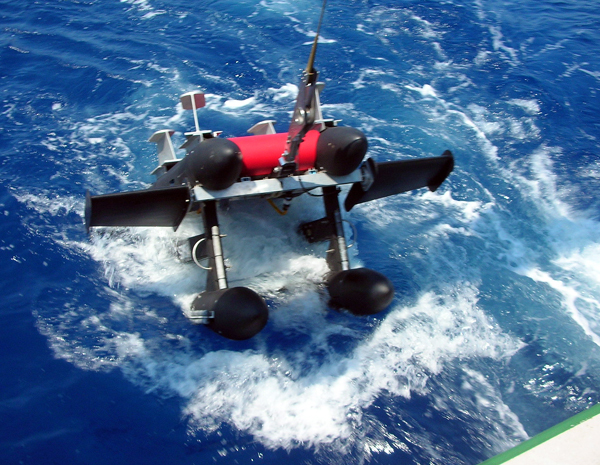 ISIIS samples continuously, resulting in a collection of digital images that record the exact location of the various plankton organisms in relation to each other and the environment in which they live. Further, the images are recorded onto a simple hard drive instead of slurry of plankton all mixed together in a sample jar with formaldehyde (yech!). ISIIS is an underwater imaging system developed to capture real time images of plankton that are relatively rare, small, and fragile such as fish larvae and delicate gelatinous organisms (like jelly fish). 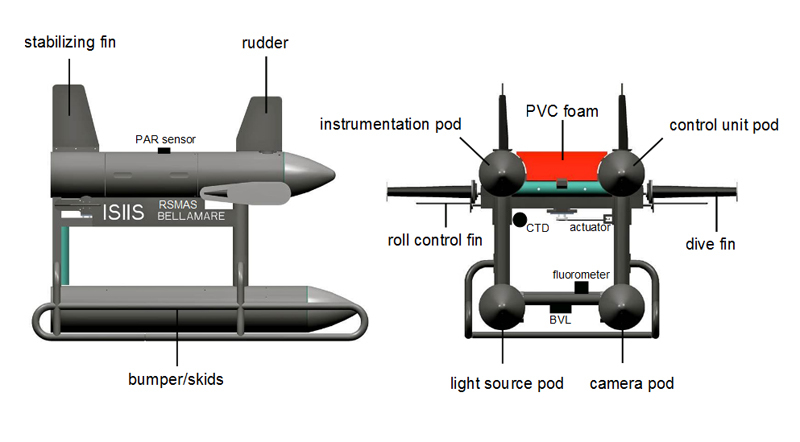 ISIIS is composed not only of a macro-camera system with its own illumination but it also is integrated into an underwater vehicle with a variety of additional sensors to measure the depth, salinity and temperature of the water, as well as such properties as dissolved oxygen, light level, and even how much chlorophyll a (measure of primary production) is present. Together, the camera and sensors provide detailed profiles and tracks of what plankton are where and what the ocean environment around them is like. 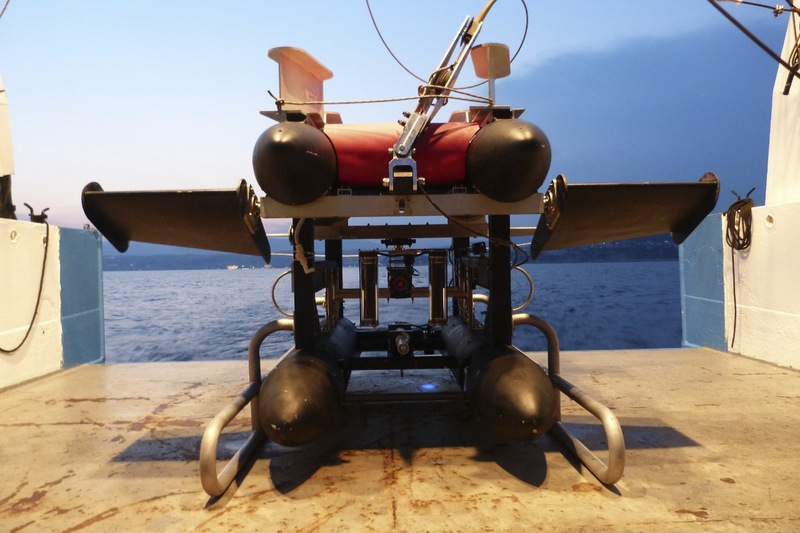 The vehicle, and associated imaging system and sensors, moves up and down through the water column using side-mounted, user-controlled dive fins (like an underwater glider) while being towed behind an oceanographic ship moving at 5 knots. The vehicle frame is divided into four compartmentalized enclosures with imaging and optical equipment seamlessly integrated into ISIIS’s ventral housings and environmental sensors and electronics in the dorsal housings. ISIIS is designed to undulate in a zigzag fashion between the surface and a maximum depth of 200 meters. The ISIIS system utilizes imaging technology very similar to an office scanner flipped on its side. The imaged parcel of water passes between the forward portions of two streamlined pods where it is “scanned” and transformed into a continuous image. 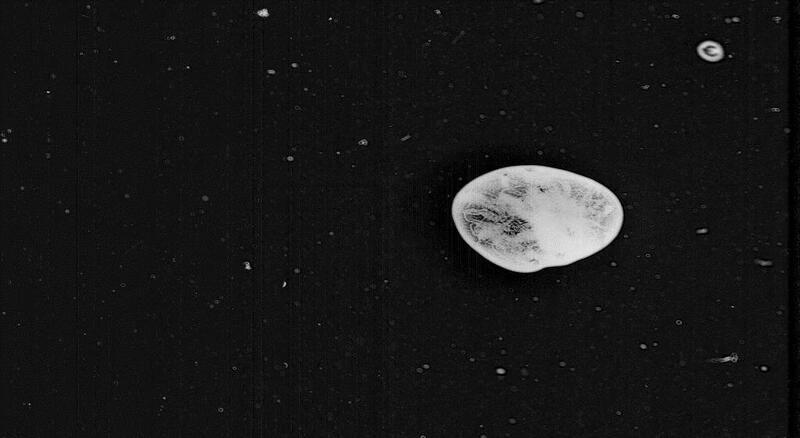 The resulting very high-resolution image is of plankton in their natural position and orientation. When a sufficient volume of water is imaged this way, quantification of concentration (individuals per unit volume) and fine scale distribution is possible. ISIIS is capable of imaging a maximum of 162 Liters (43 gallons) of water per second (when moving at 5 knots) with a pixel resolution of 70 µm (the thickness of a human hair). 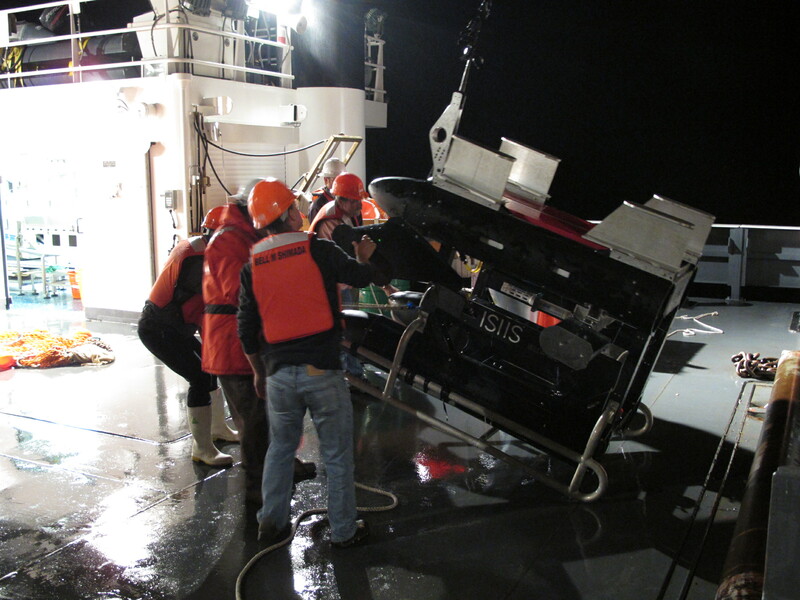 The imaging data and associated oceanographic data are sent to the surface ship via a fiber optic cable and recorder onto a main computer for later viewing and analysis.